Almost any plant that grows outdoors can grow indoors, as long as you provide it with an environment that replicates the plant’s ideal growing conditions. This includes water garden plants, such as water lilies. 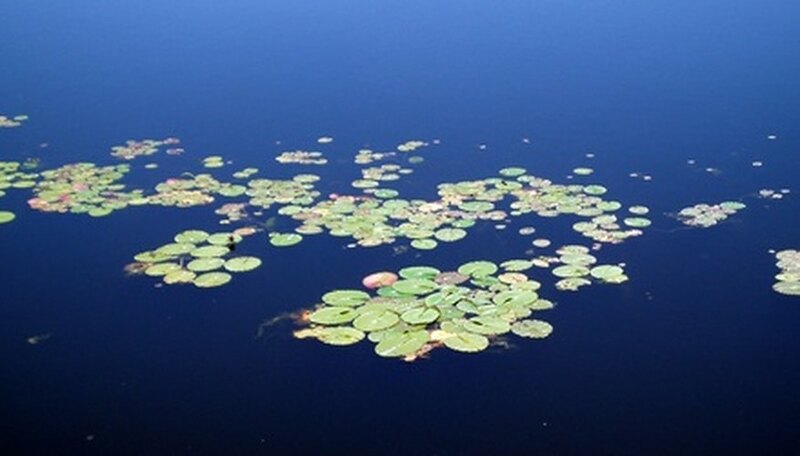 Water lilies are divided into tropical and hardy water lilies. Tropical water lilies will not overwinter north of USDA zone 9, form root crowns, have thin, serrated edged lily pads and form flowers on stalks. Hardy water lilies will overwinter north of USDA zone 9, have rhizomes for roots, thicker, smooth-edged lily pads and floating blossoms. Growing an indoor water garden is similar in process to keeping an indoor aquarium. Select a container that is adequately sized for your indoor space. A plastic pot will work well for a living room or office, while a rain barrel may be a better choice for a greenhouse or sunroom with less foot traffic and furniture. Select hardy, dwarf-sized water lilies for growing indoors. Hardy lilies are adapted for water that is cooler than 70 degrees F. In some homes, the ambient air is kept at a constant rate of 68 degrees F. The water in your indoor container will be consistent with this temperature. Fill the container with water until it is at a point several inches away from the top. Never fill the container to the brim. A container can overflow from displacement of water when you add water lily containers. Allow the water to sit for several days to disperse chlorine and other additives in the water. Fill a small aquatic net basket halfway with a potting substrate, such as sand, perlite or aquatic potting soil. Place the rhizome of the lily into the soil at a 45-degree angle. Cover the basket with soil and 1 inch of sand. The growing tip of the rhizome should be above the soil line. Place the net basket in the bottom of the container. Position the container filled with water a few inches beneath a grow light. Water lilies require full sun outdoors. Indoors, they need strong light for 16 hours daily to bear flowers. Place the grow light on a timer and set the timer to automatically turn on and off. Add a liquid fertilizer formulated for aquatic plants to promote more blooms from your lilies. Choose a wide container if you plant to plant a variety of plants. Lilies will spread their pads over the surface of water and block light from penetrating beneath the surface in narrow containers.